1 Ohio has been a popular location to visit for over 10,000 years. The Native Americans first used this area of the country as hunting grounds as early as 5,000 B.C.E. (Before the Common Era). For five thousand years people would come into the Ohio area, particularly the Ohio River Valley and Lake Erie coastline, to grow crops, fish, hunt large game, and gather roots, nuts, and berries native to Ohio. 2 The first Native American groups to call Ohio home were probably the Mound Builders, the Adena, and the Hopewell. These three nations lived in the Ohio region and set-up permanent homes around the first century C.E. (Common Era) and are called the prehistoric tribes. They lived in the southern areas of the state because of the good soil and long growing season for their crops. They probably traveled to the northern areas of Ohio looking for large game. 3 The Mound Builders, Adena, and Hopewell are remembered today for the wonderful earth mounds that they left. Most of the mounds are simple burial mounds. These burial mounds tell us what the culture valued most and if the person who was buried there was male or female. Some of the mounds they created look like animals when you see them from a hill or an airplane. These are called "effigy mounds." 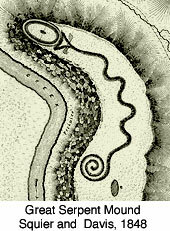 The most famous of these is the Great Serpent Mound which is in Adams County. It is 1,330 feet long and averages 3 feet high. It coils around on itself and looks like it is eating an egg. 4 No one knows why the Mound Builders, Adena, and Hopewell were not in the area when later Native American groups moved there. When the prehistoric natives left Ohio, the area went back to being a hunting ground for many centuries. It was not until the 1600's that the Erie or Cat Nation made Ohio home again. There is no other record of a tribe living in Ohio for this time period. The Erie are believed to have been pushed out of the area or killed by the Iroquois Confederacy in the 1650's. The Iroquois were enemies of the Erie who hunted in the Ohio area. The Iroquois lived in New York most of the time.